"It is about the wellbeing of the people in your county"
Tyrone manager Mickey Harte celebrates. 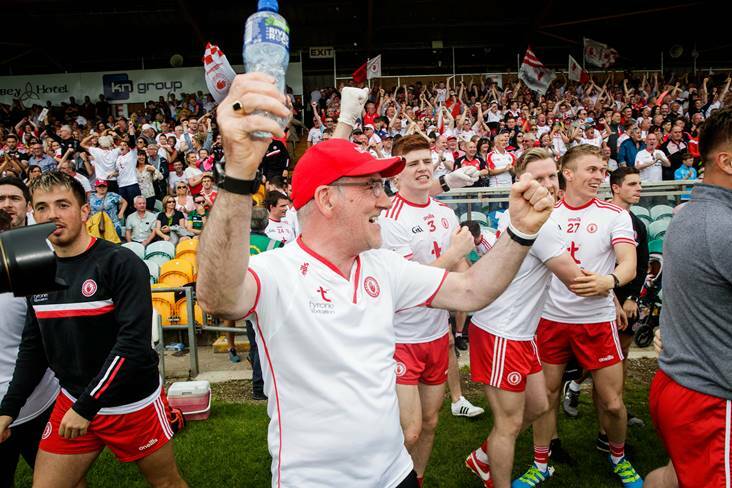 Mickey Harte feels that his team owed the people of Tyrone another All-Ireland final appearance. "If you have been in four semi-finals and go home with nothing to do for the next month only watch other teams go for it, there is an awful sense of anti-climax," he told The Irish News. "We know the people of Tyrone. They love their football and love to get energised by it. And we felt for the last number of years that we kind of let them down somehow. "They just wanted to express themselves in terms of being here on All-Ireland final day. Maybe we got a wee bit spoilt with three in five years in the 'noughties, but still there is a longing in the people of Tyrone to be here on All-Ireland final day. "And we always felt we were playing for them. That's what we do it for. We don't do it for ourselves. We do it for those good people who travel miles and miles to support it; people who have family issues where football brings them some consolation. So it's not just about Gaelic games or about playing football, it is about the wellbeing of the people in your county."